In celebration of the 200th Anniversary of the birth of Charles Dickens, his great, great grandson Gerald Dickens performs the premiere of a brand new show, specifically written for the bicentenary, entitled 'The Complete Works of Charles Dickens' featuring extracts from all the major novels in chronological order. 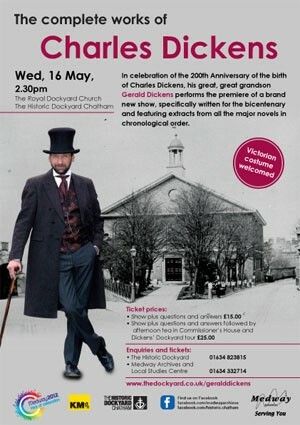 This premiere takes place in the Royal Dockyard Church within The Historic Dockyard Chatham - a place that Charles knew well from his childhood days when his father was a Clerk in the Navy Pay Office at the Dockyard. A special ‘Question and Answer’ session will be hosted by Gerald at the end of the show. Following the performance in the Royal Dockyard Church there is an opportunity to take Afternoon Tea in Commissioner’s House, Britain’s oldest Naval Building still intact and in use today and then to join the Dickens’ Dockyard Tour which, with a costumed guide, provides an insight into why this literary giant was so familiar with the dockyard and explains why he considered it a “place of wonderment”. Ticket prices are £15 for the show plus Q&A and £25 for the Show plus Q&A followed by Afternoon Tea and Tour.